Engage in a unique opportunity. When our students arrive at LSMSA, they bring with them diverse experiences, interests and talents. LSMSA helps students learn to live together in a diverse environment while emphasizing the importance of individual responsibility and choices. Our campus-wide activities range from casual and formal dances, to cultural celebrations, to athletic and recreational competitions. 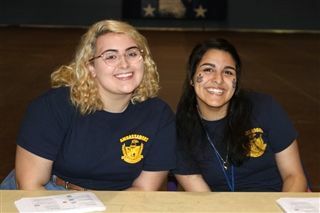 Our students develop leadership skills by joining student organizations, strengthen academic skills by attending time management workshops and deepen their commitment to serving others by volunteering throughout our local community. All students live in residence halls under the supervision of a professionally trained, full-time student services staff while engaging in and exploring extracurricular activities. LSMSA has a female residence hall (Caddo Hall) and a separate male residence hall (Prudhomme Hall). The Student Life Advisors engage with students in a wide range of cultural, educational, leadership, recreational, social and wellness activities - encouraging students to make positive choices, build lasting friendships and search for a sense of balance between academic and personal growth. Our residential life staff also plans educational and social activiites for students to relax and recharge from the rigors of academic life. Our student organizations perform community service, attend conferences and conventions, sponsor activities on campus and participate in fundraising. Together with the various student services departments, more than 50 student clubs and organizations enhance the quality of life for our entire LSMSA community. Students can get involved on and off campus, develop leadership skills and shape their LSMSA experience. The work service program encourages students to enhance basic life skills and, while doing so, connect with an adult who models a positive work ethic. All students contribute three hours of supervised work weekly to LSMSA and the surrounding community. LSMSA's athletics program is designed to encourage students to develop and maintain habits that will promote healthy lifestyles though lifetime sports. Superior skill levels and previous experience are not required for participation in LSMSA's activities; there is a place both for the beginner and for the advanced competitor. From interscholastic athletics to informal recreation, the athletics and recreation office offers something for all skill levels. Students can compete in a variety of varsity athletics at LSMSA. Additionally, we have special agreements with two local high schools, Natchitoches Central High School (5A) and St. Mary’s School (1A), that will allow our students to participate in more competitive athletics programs and engage in sports not offered at LSMSA.